Once gain, Yehey! invited several bloggers on behalf of Tokyo Tokyo for another exciting activity that requires us again to solve a puzzles and clues and hunt for prawn mascots scattered in Trinoma Mall. Our first target is James Leprawn, characterized by being athletic and outgoing. So where in the mall is the closest place he can do his thing? We rushed to the arcade area where we thought we can find him first because the basketball rings are there but we are wrong for we found two more impostor mascots wearing shrimp costumes as oppose to prawn costumes. But analyzing the clues much dipper gave us the answer and we found ourselves chasing James LePrawn inside the mall. We cornered him and finally taken a photo as a proof of capture hahahaha. Then now we need to look for the final prawn, Prawnes Hilton. Characterized for being shopaholic and sosy. Then it means, Prawnes could be hanging out in a section of the mall with girly stuff which my girl teammates know. We quickly tracked Prawnes and took her photos as a proof of capture. Sadly we are only second place but still we enjoy the chase challenge. Then we returned to Tokyo Tokyo where the Tokyo Tokyo management revealed the purpose of the challenge. In Celebration of Tokyo Tokyo's 24th year in the Industry, Tokyo Tokyo is serving us with a bigger and crunchier Tempura that satisfies our big cravings. Using Black Tiger Prawns and a special batter mixture, Tokyo Tokyo's Tempura transformed into the biggest Tempura yet served for you. They also introduced us the newest TVCs featuring the mascots we hunt earlier. Then after awarding the winner of the days challenge, we got the chance to enjoy the Tempura which is indeed much bigger and much crunchier. The rest of the day is pure bonding with fellow bloggers and with my friends in Yehey! 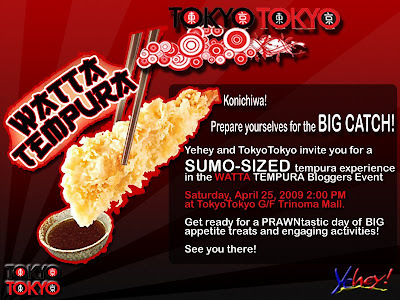 So go to the nearest Tokyo Tokyo and enjoy a Watta Tempura day with their newest, biggest and crunchiest Tempura ever.